They are both known for their scene stealing shenanigans, their cute and cheeky nature and their heart warming antics. Now everyone’s favourite pint-sized prince and everyone’s favourite yellow bear have finally come face to face, in book form at least. It’s hard to believe that “the bear with very little brain” is celebrating his 90th birthday (just a few short weeks after Queen Elizabeth commemorated the same birthday milestone). 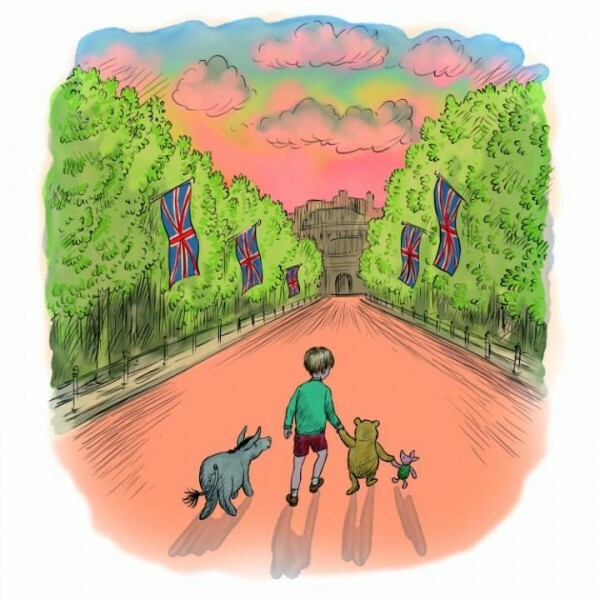 A.A. Milne’s beloved bear is marking the milestone with a grand trip to meet the Queen and Prince George in the newest book, Winnie-the-Pooh and the Royal Birthday. Written by Jane Riordan and illustrated by Mark Burgess and available as an electronic version only, the book follows Pooh and his mates, Piglet, Eeyore and Christopher Robin as they travel out of the Hundred Acre Wood and into the busy streets of London. 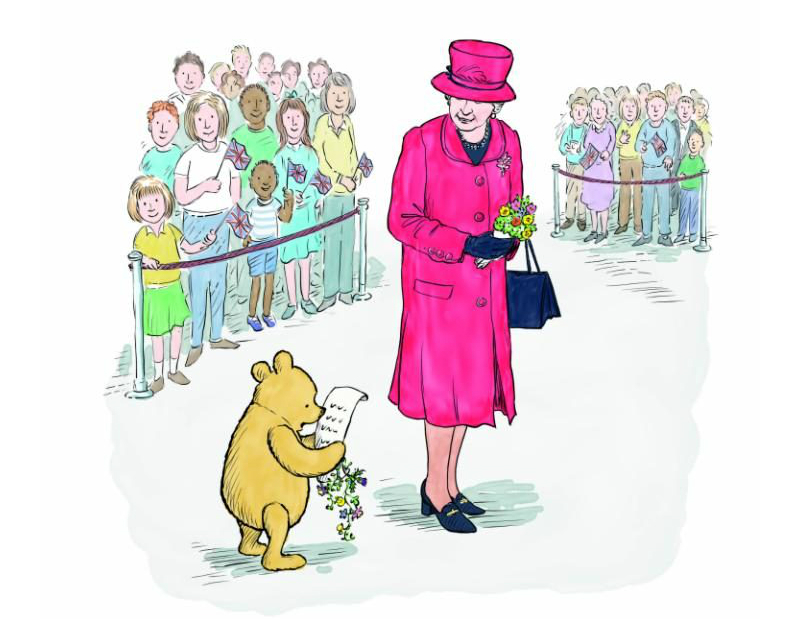 During their travels, Pooh delivers a special poem to the Queen and he and his fictional friends meet Prince George, dressed in his trademark blue. The adorable prince is described as “much younger than Christopher Robin and almost as bouncy as Tigger”. 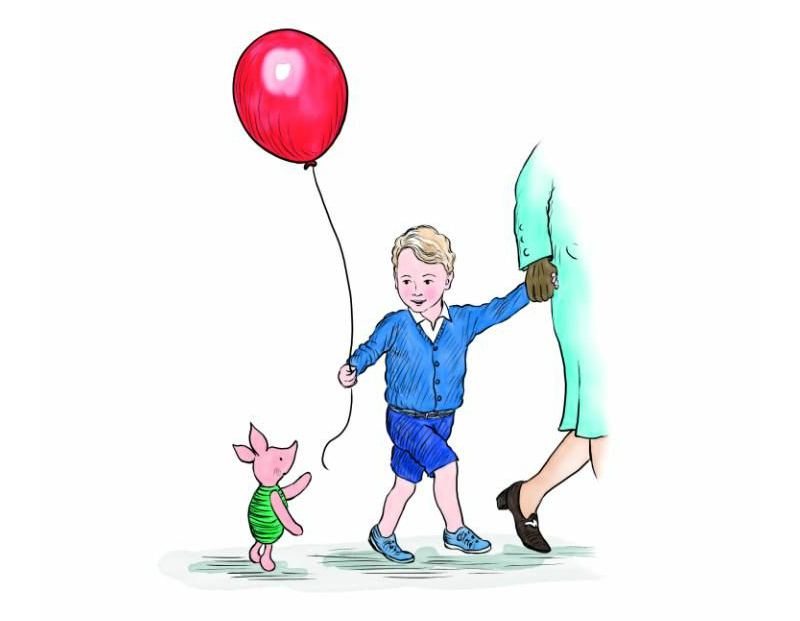 He jumps up and down in delight when he sees Piglet and his red balloon and pats Piglet while tickling Pooh’s ears. Although they share the same birth year (1926), Pooh Bear and Queen Elizabeth II had yet to meet, until now. However, the Queen has been a fan of the bear for a very long time. One of the first books to feature Pooh, called Teddy Bear and the Other Songs From When We Were Very Young was dedicated to the then-baby Princess Elizabeth and one of the gifts the Queen received as a child was a hand-painted Christopher Robin china nursery set. With the same loveable characters, beautiful illustrations and child-like text, the latest book in the Winnie-The-Pooh series, although not available in hard copy, is sure to be a treasure for young and old. Disney, which owns the rights to Winnie-the-Pooh, has released a YouTube video of the story as well as the electronic version.